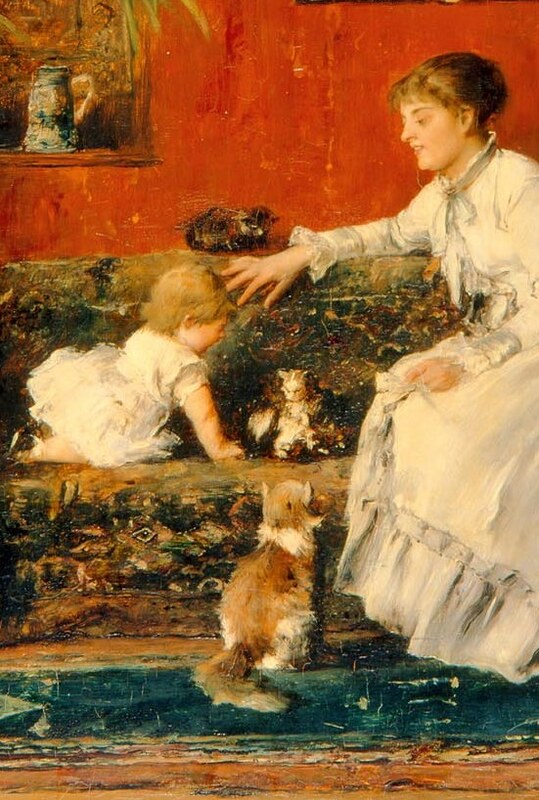 Mihály Munkácsy (Hungarian, 1844–1900), The Rivals (Little Kittens), 1885. Oil on wood panel, 34 3/4 x 45 11/16 in. Milwaukee Art Museum, Layton Art Collection, Gift of Frederick Layton L139. Photo credit P. Richard Eells. In honor of mother’s day this month, I thought that I would write about a painting that not only features one mother, but two! You’ll find The Rivals (Little Kittens) by Mihály Munkácsy (Hungarian, 1844-1900) in the Museum’s Gallery #10 with 19th-century European paintings. The painting shows a woman (mother #1) and her child on a sofa watching two kittens wrestling. Meanwhile, a cat (mother #2) sits on the floor, watching the tussle from below. Dated 1885, The Rivals shows us a comfortable French drawing room of what Americans recognized as the Victorian period. This family is clearly well-off financially, with up-to-date furnishings, opulent red decorations, and a fantastic potted plant. Visible in the lower left, even the cat has her own fur-lined bed. In fact, having housecats at all meant the family was of means. In the late 19th century, it had become a popular trend for the upper middle class to own cats. As can be deduced by the family-oriented subject, the painting was aimed at a bourgeois market interested in displaying ideals such as domesticity, prosperity, and refinement. These were known as salon pictures, which is the French word for living room. Most would consider it a sentimental subject—especially because it includes baby animals. That was, of course, one of the selling points. 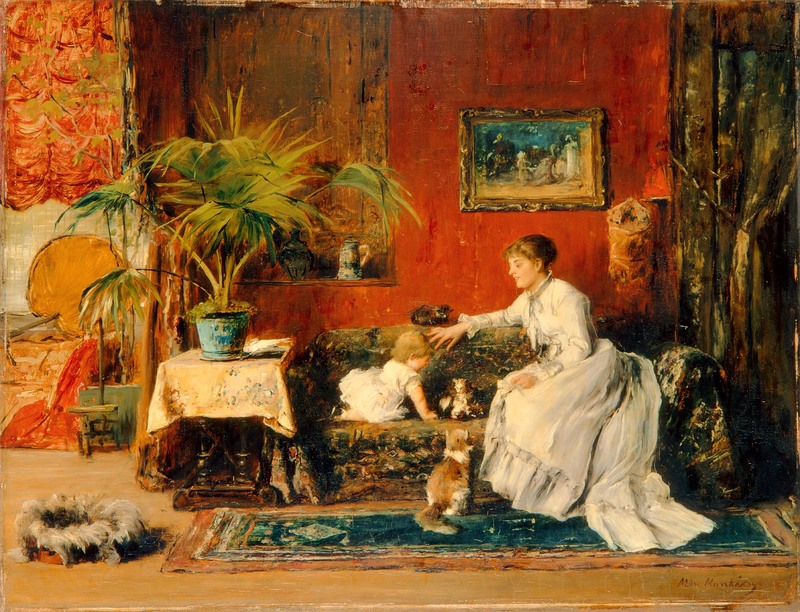 Victorian-era paintings would often use animals to reflect human traits, such as the curiosity of the young, the content and loving mother, or in this case, the conflicts between siblings! But behind this sweet and beautiful painting is an artist with an interesting story. And along the way, it brings to light some great primary resources that reflect artistic taste in late 19th-century Milwaukee. Although he is practically unknown today, Mihály Munkácsy was one of the most famous artists in late 19th century. The artist was born into a poor family as Micahel Lieb in the small village of Munkács, Hungary. As a student, wealthy patrons paid his way to the best art establishments in Vienna, Munich, and Düsseldorf. As an adult, he took on the name of his home Munkács as the pseudonym Mihály Munkácsy (MEE-high Moon-KATCH-y), which you can see below in the detail of the artist’s signature on The Rivals. Mihály Munkácsy, The Rivals , 1885. Detail. Layton Art Collection, Gift of Frederick Layton L139. Photo credit P. Richard Eells. In Düsseldorf, he spent three years in the circle of Ludwig Knaus (German, 1829-1910). Knaus was one of the leading genre painters of the time, and the Milwaukee Art Museum owns a number of his paintings, including Dance under the Linden Tree. As a result, Munkácsy’s early works were very much standard German genre paintings. He was, however, drawn to a more Realist style and subject. A large part of this was probably due to his 1867 visit to Paris which allowed him to see paintings by French Realists Gustave Courbet (1819-1877) and Jean-François Millet (1814-1875). In 1870, Munkácsy won a gold medal at the Paris Salon for the monumental painting The Condemned Cell. The Condemned Cell depicts a tense, psychological scene of many figures reacting to a highwayman’s sentence of death. Munkácsy had quickly proved that he was a master is using the juxtaposition of dark and light tones and a vigorous brushstroke to evoke emotion. So, at age 26, Munkácsy was the most celebrated painter in Paris, where he moved in 1871. His early success, however, weighed on him and made him exceptionally sensitive to criticism, to the point that his production diminished. He was taken in by a French aristocrat, Baron De Marches, and slowly began to paint more. The Baron died in 1873, and a year later Munkácsy married his widow, with whom he had become good friends. By 1875, Munkácsy was again disappointed with his trouble selling paintings, and in an effort to support himself and his elegant wife in expensive Paris, his style began to change. His colors became lighter—possibly influenced by the Impressionists, although he did not care for their style. He also began painting interior scenes of fashionable homes and their inmates. The market for these paintings was huge, both in Europe and North America, and in 1878 he signed a 10-year contract with the dealer Charles Sedelmeyer. It is during the period that Munkácsy worked with Sedelmeyer that the Museum’s Little Rivals painting was made and purchased by Frederick Layton, the Milwaukee meat packer and philanthropist who founded the Layton Art Gallery. On the back of the painting there is even a label with Sedelmeyer’s name on it. Layton was just one of the wealthy Americans that snapped up works by Munkácsy; others included William H. Vanderbilt, William Astor, Potter Palmer, and Charles Frye. The Rivals was given to the Layton Art Gallery soon after the founding in 1888. Munkácsy himself went on tour to the United States in late 1886, and was treated like royalty. The city of New York honored him with a banquet at the famous restaurant Delmonico’s, which included attendees such as the mayor, newspaper publisher Joseph Pulitzer (1847-1911) (who was also Hungarian), and preacher Henry Ward Beecher. Later, in Washington, D.C., President Grover Cleveland held a banquet at the White House in Munkácsy’s honor. Frederick Layton purchased a second painting by Munkácsy for the Layton Collection in 1893. 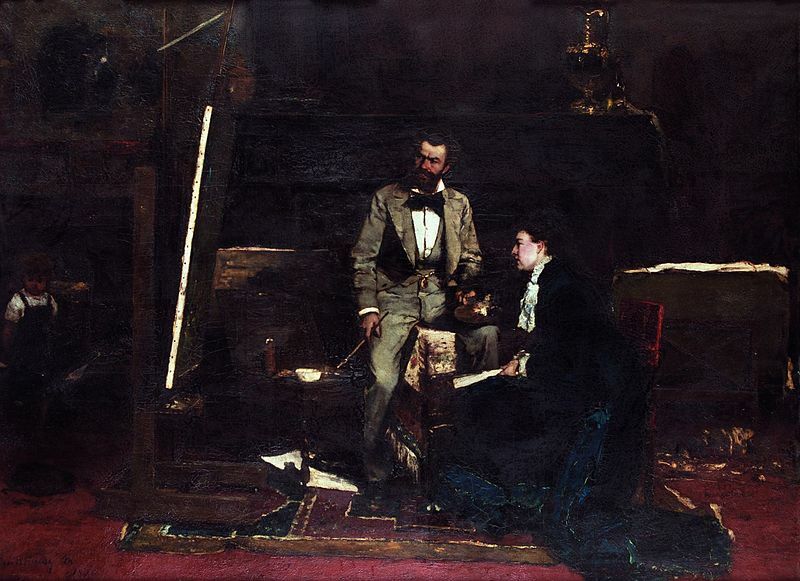 This work, In the Studio (a smaller version of the same painting is shown below), shows the artist and his family in his studio. This Layton acquisition merited almost a column’s worth in the January 31, 1893 Milwaukee Sentinel. The author waxes poetically about its picturesque qualities and the painter’s abilities as both colorist and draftsman. He says the artist Munkácsy “has no tricks” because “[t]here is nothing in his works, whose counterpart cannot be found somewhere in nature.” It is a perfect balance between realism and art. Mihály Munkácsy, In the Studio, 1876. Oil on panel, 37.8 x 51.6 in. Hungarian National Gallery. The half tone is the key of the whole work and through it everything else is to be worked out in harmony, whether cold or warm, light or dark and so on. This is really the principle of the impressionists who teach us a very good elementary lesson in art, but the trouble with the impressionists is that they make such confounded daubs…. An impressionist will tell you that anybody can draw but few can produce beautiful tones, but don’t believe him—he lies, for it is just the reverse. Clearly Munkácsy is the winner in Milwaukee’s art scene when compared to the Impressionists! In the Studio was deacessioned by the Layton Art Collection in 1960. The whereabouts of that painting is unknown, but the same composition in a smaller size is now in the collection of the Hungarian National Museum. Luckily, Milwaukee still has The Rivals (Little Kittens) to represent this famous artist of the late 19th century. In Munkácsy’s late career, after his contract with Sedelmeyer expired, he had some state commissions, although in general his art style was becoming old-fashioned. As a personality, however, was still a huge super-star, and his international fame had made him a national hero in Hungary. Upon his death in 1900, Hungary held a huge state funeral, the largest ever for a Hungarian artist. It is interesting to note that Little Kittens is the title that Munkácsy gave the painting in his 1885 ledger, and in scholarly literature this is usually the title used. The Rivals was the title used in the Layton Art Gallery catalogs. But, why the difference, we aren’t sure. In 1958, three other versions of our painting were known to exist, illustrating that Munkácsy would paint multiples of the same work if it sold well. So, now you know who the real international art celebrity of the late 19th century was—not Monet, not Renoir, not Degas, but Mihály Munkácsy. And, Happy Mother’s Day to my mom, who loves both cats and art! This entry was posted in Art, Curatorial and tagged 19th Century Art, 19th century Milwaukee, European art, Hungarian art, Layton Art Gallery, paintings. Bookmark the permalink.